Here are our recommendations for first steps you can take to build, change, or enhance your read aloud. The lesson planning template is your partner in planning a successful Intentional Read Aloud lesson. The template is equipped with helpful prompts that focus your attention and support your thinking through the planning of each lesson component. When a draft of the lesson is completed, rehearse it. The rehearsal has a threefold purpose. It enables you to assess the timing of the lesson as a whole and of each individual component. It gives you the opportunity to hear what the language you have chosen sounds like to your own ear, which is often quite useful since the ear is a better editor than the eye. And it helps you build familiarity with the lesson, which will help it run more smoothly. Select a book that addresses your chosen literacy goal for the read aloud. Read the book to yourself to verify that it is an appropriate book to address the goal. Complete a draft of the lesson template using the guidance of the prompts and the questions. Rehearse the lesson by reading the book aloud and using the language that you have written on the template. Keep your eye on the clock to make sure that the lesson is completed in approximately 20 minutes. Make adjustments to your lesson plan to address issues that arose during the rehearsal. Choose learning goals based on children’s needs, standards, and curriculum scope and sequence. Consider a variety of factors when choosing a goal for the read aloud, such as standards, grade level curriculum scope and sequences, and formative assessment data (e.g., spelling inventories, running records, and conference notes). For example, you might select a goal based on anecdotal notes from Reading Workshop. It is important that the chosen goal be appropriate for the majority of the class rather than just a few children. Other factors that you might consider when choosing goals include connections to themes and/or content areas (e.g., identify important details about slavery while reading Henry’s Freedom Box), authors (e.g., compare and contrast two books by the same author), and children’s interests (based on teacher observations, interest inventories, etc.). Thoughtful selection of learning goals results in instruction that is more focused, meaningful, and engaging for the children, resulting in greater overall literacy learning during the lesson. 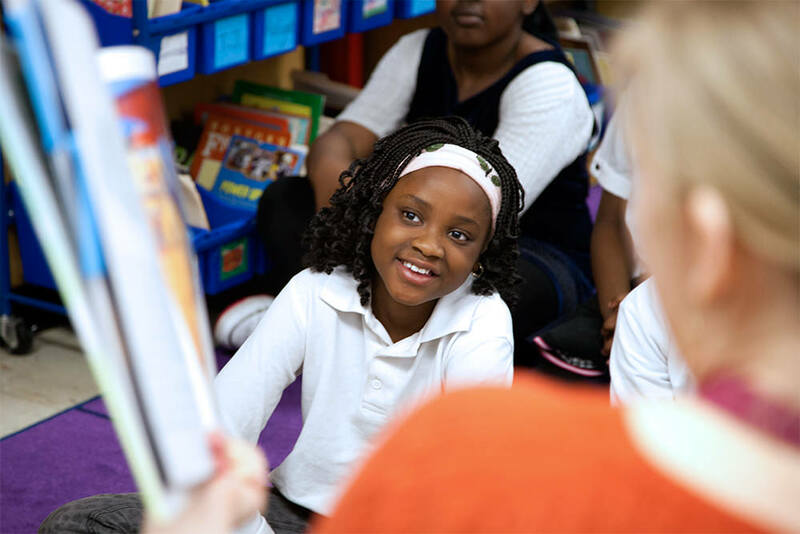 Review the reading standards for your grade level and choose a goal that would be appropriate to teach to the whole class through a read aloud. Gather formative assessment data (e.g., conference records, anecdotal notes, and spelling inventories) on your children and use this information to choose a goal for a read aloud. Make a list of upcoming themes (e.g., seasons, friendship) and content area (e.g., math, science, social studies) units of study that you plan to teach and use this information to select one or more goals for future read alouds. Administer an interest inventory to the children and use the data to inform goals for upcoming read alouds. Meet with a colleague to choose goals for several read aloud lessons, using standards and formative assessments as the basis for the goal selection. Choose a goal for a read aloud that allows the children to compare/contrast either two books by the same author or two texts on the same topic by different authors. Keep a list of read aloud goals as you teach them, along with the corresponding books. After teaching a read aloud, assess its success based on evidence of children’s learning and decide whether or not the goal was appropriate for the whole class. Select high quality books at the appropriate listening comprehension level. Taking the time to make thoughtful text selections prior to the read aloud has the same important benefit specified above for thoughtful selection of learning goals – instruction that is more focused, meaningful, and engaging for the children, resulting in greater overall literacy learning during the lesson. 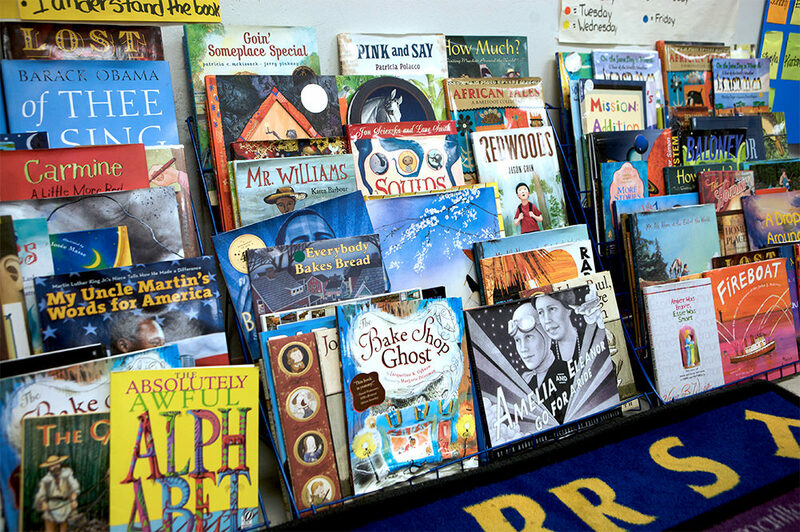 Gather a collection of books that are one or two grade levels higher than most of your children can read independently as possible candidates for read alouds. Administer an interest inventory to your children and use the results to guide your text selection for a read aloud. Select a book based on a theme and/or content area focus. Sort your candidate read aloud books by genre, theme, author, etc. Separate your candidate read aloud books into two categories: picture books and chapter books. Browse through your candidate read aloud collection and make a list of the ones that interest you personally. If you’re reading a book that you love, it will show on your face and be evident in your voice, resulting in a more effective performance for your children. Practice purposefully choosing read aloud texts with a colleague. Choose and mark a few stopping points to think aloud, ask questions, or teach vocabulary to support learning goals. Listen to the teacher think aloud about the text. Answer a text-dependent or open-ended question. Contribute to the recording of information on a chart. Learn robust vocabulary with a child-friendly definition. Note that the vocabulary words do not necessarily have to be related to the primary learning goal. Designate three or four places to stop during the reading of the book, making sure that each of the stopping places provides a good opportunity to directly address the literacy goal or the planned vocabulary instruction. Mark each of the places with a sticky note. Jot down a prompt for yourself on each sticky note, including the actual language that you will use with the children. Be mindful of the time spent during stopping points. Keep the lesson on track to be completed in a timely manner. Develop procedures to help children take care of themselves and others during the lesson. Intentional Read Alouds take place in the whole group meeting area. To ensure the comfort, enjoyment, and timeliness, as well as an optimal learning environment, lesson procedures focused on expected responsibilities and learning strategies are taught, reviewed, refined, and practiced. The lesson procedures and learning strategies are explicitly taught in a series of full procedural lessons apart from and prior to the Intentional Read Aloud lesson. The information from those procedural lessons is recorded on anchor charts. The anchor charts are posted in the large group meeting area in a place where all the children can see them. The procedural lessons address how the children transition from their chairs to the rug, where they sit on the rug, how to actively listen to the speaker, and how to engage in learning strategies such as turn and talk. Procedures are practiced, self-assessed, and reflected upon. Prior to each Intentional Read Aloud lesson, one or more of these procedures are reviewed and reinforced with the support of the anchor chart. Plan and teach procedural lessons on the expected responsibilities and strategies to facilitate learning during the read aloud lesson. Practice the routines that support the children’s responsibilities and learning strategies of a successful read aloud. Co-create anchor charts for each of the procedures. Display anchor charts in the large group meeting area where the children can see them. When planning an Intentional Read Aloud lesson, select a responsibility or strategy that could have been done better in past lessons to explicitly address and review. Create a joyful climate around listening to and learning from books. 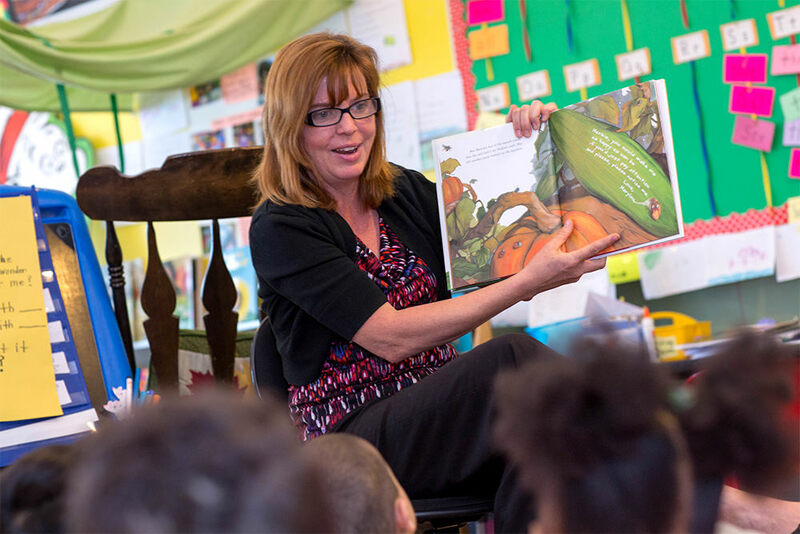 Joyful read alouds are absolutely essential for young learners. Read aloud time is your opportunity to “sell” reading to your children. The importance of an attractive large group meeting area with comfortable seating is a critical component of creating a joyful climate. The warm and connected communal setting, the irresistible book, and your polished, practiced read aloud performance will help to compel the children to willingly and eagerly take on the complex task of learning to read. Rituals, songs, and chants help to enhance and build the feeling of community. The positive feelings and the fact that you are doing all of the “heavy lifting” to access the wonderful text will have your children primed and ready to learn. Teach your children a song declaring that it is time for a read aloud. The song might address the expected behaviors for their time on the rug. Seat the children on the floor in close proximity to you and each other, in full view of the book. Make the book that you have just read aloud available to the children for them to look through. It will be the most popular book in the classroom. Gather children in close proximity in a comfortable setting. Gather the children in close proximity for read alouds. This often happens in the whole group meeting area, library, or reading corner, with the teacher sitting in a rocking chair or other special seat and the children facing him or her in rows on the rug (on an angle if the chair is in a corner.) The setting for this read aloud should be a comfortable and cozy spot (e.g., with pillows, bean bags, lamps, etc. ), and the children should always have a clear view of the teacher and the text. Sometimes teachers assign the children regular seats (e.g., next to their “turn and talk” partners), possibly even designating spots with a piece of colored tape, a circle on the rug, etc. Teach children rug responsibilities by creating and posting anchor charts with them. 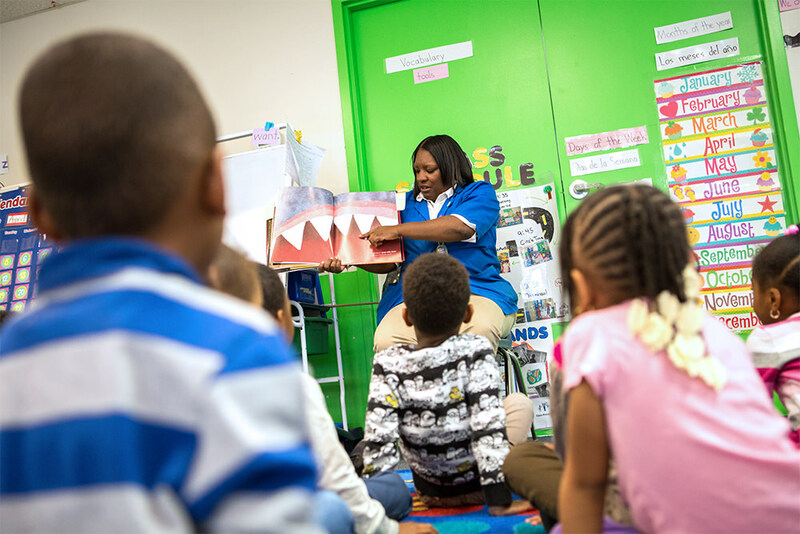 Gathering the children together for read alouds allows them to see and interact with the text, which increases engagement and overall literacy learning during the lesson. It also fosters a community of learners and a love of books. Create a whole group meeting area and/or reading corner in your room where children can gather for read alouds. Make the read aloud area comfortable and cozy by adding items such as a rocking chair, pillows, lamps, etc. Assign specific spots on the rug for children who would benefit from sitting next to each other. Assign turn and talk partners, so that the children can share ideas during the lesson. Practice sitting in the new read aloud area and holding the text out for all the children to see. Introduce author, illustrator, title, and dedication. Before reading the book aloud to the class, read aloud the title, author’s name, illustrator’s name, and dedication. Doing so shows children that this book has a name, a real person wrote it, a person (or people) for whom it is written, and a person who drew the pictures or took the photographs. Following this pattern each time helps children understand the way books come into being, provides them with background knowledge on the book, and sets the stage for the reading they are about to engage in. This introduction to the book provides children with a positive entry into the reading experience while inspiring them to become authors themselves. Read the title, author, illustrator, and dedication every time you do a read aloud. Tell (or remind) children about the roles of an author and an illustrator, and explain the purpose of a dedication. Let children know they, too, can be authors and illustrators like the ones who created the books that they’ve read. When the children write their own “books” during independent writing, have them include the author’s and illustrator’s names (themselves unless there’s collaboration with others) and a dedication. Set a purpose for listening and responding. 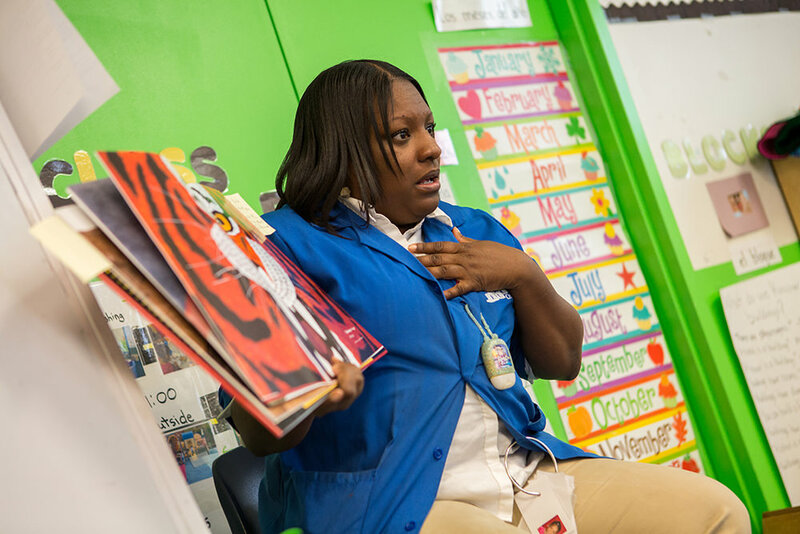 When the teacher sets a purpose for children’s listening and responding before reading, and then reiterates that purpose during and after reading, children are clear about their “job” during the read aloud. In most cases, the children’s purpose for listening and responding will be related to the primary literacy goal of the lesson. For example, if the primary literacy goal is for the children to identify key details to support the main idea, then the teacher may discuss with children the steps in identifying the main idea and key details (the “what”) and explain why this helps us as readers to understand the text (the “why”.) He or she may post that explanation at the top of a piece of chart paper in clear, child-friendly language. During reading, the class will stop to record the key details of the text. After reading, they may discuss the main idea that the details support, reiterating the “what” and “why” discussed before reading. In addition to stating the primary literacy objective as a purpose for listening and responding, you may also set expectations for how children are to respond to open-ended questions about the text (not just a one word or a simple yes or no answer), how they are to respond to text dependent questions (which can only be answered with evidence from the text), what they could do when they notice the vocabulary words discussed, and what engagement strategies they may take part in to interact with the text. When you set a clear purpose for listening and responding, the children are more likely to remain focused on the teaching that occurs during the lesson and therefore more able to apply this new learning to their independent work. Before reading, tell the children why you chose this book to read to them and what the purpose of your reading is. Connect the purpose you give children for listening and responding to the reading to the primary literacy objective of the lesson. If you have focused on certain vocabulary words in the read aloud before reading, clarify what the children should do when you get to those vocabulary words during the reading. Post the purpose for reading, listening, and responding to the read aloud and refer to it often during the read aloud. Clarify if and how children should interact and engage with the text during the reading. Reiterate the purpose for reading, listening, and responding one more time after the read aloud has been completed. Hold picture books open and facing out so everyone can see. When reading aloud to children, hold books (with the exception of pictureless chapter books and also when teaching children to visualize) facing out, so that they can see the illustrations. You should be sitting in close proximity to the children, preferably with the children sitting on the carpet in front of you while you read. It may take practice to read the book from this angle, so pre-reading the book is important. You may also need to rotate the book on occasion to ensure that everyone has an equal view of the illustrations. Giving children access to the pictures as they listen helps them to comprehend and enjoy the story and increases overall engagement. Have children sit in close proximity to you, so that they can see the pictures in the book. Practice holding the picture book out for children to see and reading the book in this manner. Encourage children to look at the pictures in the book as you read aloud. Be explicit about how looking at the pictures helps readers to understand the story. Have children read their own books that they wrote aloud to their peers in the same way that you read aloud to them. Model reading with expression and fluency. Model fluent reading behaviors such as accuracy, appropriate rate, and informative expression while reading aloud to the children. For instance, you might have them notice the way that you read with a smooth voice, as opposed to sounding robotic or monotonic, and then reflect upon how this affects their understanding of the story. Or you may model the use of punctuation as a guide to fluent reading (e.g., short break after period, excitement at exclamation point, etc.) At times, the children will practice these behaviors during the read aloud via echo, choral, or shared reading of a portion of the text. Sometimes, you may even pre-plan a specific aspect of fluency as the primary literacy goal for the read aloud (e.g., appropriate rate, accuracy, etc. ), based on the standards and informal assessments. When you read aloud with fluency and expression, the children can transfer these behaviors to their independent work, making it more likely that they will comprehend what they read. Reading with fluency also increases engagement and overall enjoyment during the lesson. Gather books that lend themselves to modeling fluency (e.g., poetry or texts with varied punctuation). Use informal assessment data (e.g., anecdotal notes, conference records) and standards to determine specific areas of fluency to highlight during instruction. Rehearse your own fluency and expression by pre-reading books aloud prior to the lesson. Provide opportunities for the children to practice fluent reading during your Intentional Read Alouds (e.g., echo, choral, or shared reading). Create extensions after the lesson (e.g., leveled texts, buddy reading), so that the children can transfer fluent behaviors to their independent work. Have a colleague or coach observe your fluency during a read aloud and provide feedback. Make adjustments as needed in future read alouds. Maintain a lively flow and pace. The Intentional Read Aloud lesson lasts for approximately 20 minutes. To ensure a high level of engagement and maximum learning, adhere to this time frame. The read aloud should strike a balance between segments where the children are “listening only” and segments where the children are interacting. Take advantage of the built-in pacing inherent to picture book construction, i.e., the page breaks and double-page spreads work to your advantage in maintaining a lively pace. Keep in mind the objective of pacing the book while pre-reading and rehearsing the read aloud before you read to the children. Plan ways to actively engage the children, such as using oral cloze to encourage them to chime in on a repetitive refrain. Use purposeful pacing to build suspense and drama. Use the picture book construction of single page illustrations and double-page spreads to facilitate the pacing of your reading. Allocate sufficient time to each double-page spread to enjoy the illustration and create a contrast with the increased pace that will be used for the upcoming pages. Use voice volume and tone in addition to pace to enhance the quality of the reading. Lead children as they discuss and respond to a book. Continue to add to a chart or graphic organizer focused on the content or goal of the read aloud. Have the children respond to the story in writing in a reading journal. Create a chart or graphic organizer that summarizes or synthesizes the content and learning from the read aloud. Have children respond to the story read aloud during centers and/or independent work time. Have children respond to the story in some creative way (e.g., role play, book report, literature circle, visual arts).